Have literally dragged myself to sit in front of the computer to type a few lines for the last post of this great marathon. Seriously, when I began this month with a challenge of this kind, I never thought I would have honoured the commitment. I owe all the enthusiasm to the bloggers who participated in the marathon and who kept the spirit of the challenge alive. And, after living up to the challenge for all the days, giving up on the last even if the body is protesting, is not done. Listing down the best and worst of 2012 had been on my mind but somehow I couldn't get down to writing it down. 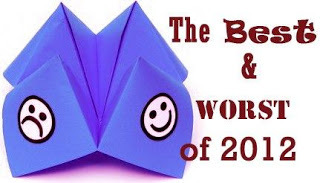 So, here I'm before the year ends and to give a befitting sign off for the lovely 31 days of non-stop blogging. Personally, this year has been quite good for me on all fronts. From taking the debut trip to a place outside of India, to having begun to work from home, (albeit on a very small scale) the year has been kind to me. When I think of the worst, I can only think of how badly we, as a society, have deteriorated. This year has been the culmination of scams, violence against women and evaporating humanity. Also, we lost a major chunk of our music and film stalwarts in this year. Hoping that that the new year brings a lot of positivity, for all of us. May we take steps to redeem ourselves and make this world a better place to be in. Happy New Year 2013 to everyone!!! I beleive that if we did not have the ups and downs then life will be bland..
hopefully we have fallen so DOWN that the next step can only be UP as a society.. Happy New Year Uma.. Have a rocking one! Happy New Year to you! The reason behind so many scams and scandals is probably the Ascension - anything not built on grounds of benefiting the larger good of society was meant to crumple down and fall! Happy New Year to a better year for all of us, and we all have to work to making it a better one. A big thumbs up for the marathon run! Uma you did a very nice job of running the blog marathon! Kudos to you. your will and determination must be much appreciated. I can understand the self inflicted pressure of committing to write something day after day. I must commend you for doing such a wonderful job! you have set the bar high for fellow bloggers!